*It’s been almost a week since Power 105’s “The Breakfast Club” co-host Charlamange Tha God exposed Floyd “Money” Mayweather‘s reading challenges after being instigated by 50 Cent.. In another article on Mayweather’s reading problem, Marc Lamont Hill sided with the boxer while highlighting the reality that millions of others in this country have the SAME problem. “I have worked with Floyd Mayweather since 2005 and feel it is only right that I come to his defense. The unfair reports that Floyd cannot read, which have been posted on social media by various individuals and reported by certain media outlets, are simply not true. The proof is in the pudding. 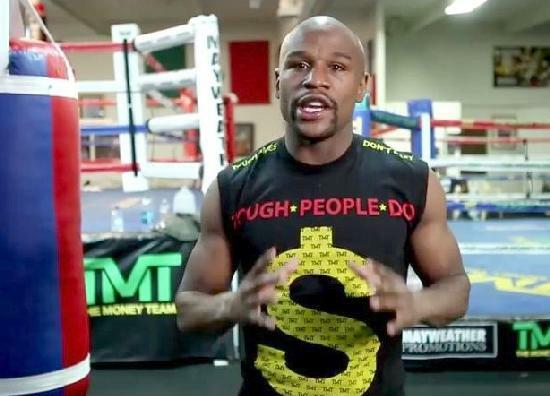 “Please watch the video (below) that was recorded by Floyd for promotional purposes (which included taping a spot for a CBS College Football game and a spot promoting his fight against Marcos Maidana. “Almost Flawlessly Read a Promo” ;? I told y’all that boy can read. Some folks just get overly anxious when they have to read for an audience. I learned that from when I was in school. Then again, some folks will say that he wasn’t reading, but was repeating something that was memorized. Cause 50 said it was.